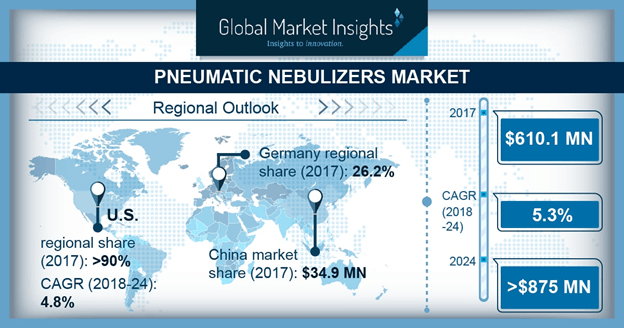 Pneumatic Nebulizers Market size is set to exceed USD 875 million by 2024; according to a new research report by Global Market Insights. Rising elderly population across the globe will stimulate global pneumatic nebulizers market growth over the forthcoming period. Geriatric population is prone to suffer from numerous respiratory disorders. About 15% of middle-aged and older adults are affected by some form of lung disorders. Thus, with growing geriatric pool, incidence of respiratory disorders will significantly increase over the upcoming period, thereby boosting pneumatic nebulizers market size. Increasing pervasiveness of respiratory disorders such as chronic obstructive pulmonary disease (COPD) will accelerate demand for pneumatic nebulizers. Over 65 million people across the globe suffer from moderate to severe COPD. Rising risk factors such as smoking, poor eating habits and altered lifestyle of people should increase prevalence of COPD. Such factors will escalate the adoption of pneumatic nebulizers in upcoming years. Breath-actuated pneumatic nebulizers segment held largest market size of USD 366.3 million in 2017. Breath-actuated pressurized metered dose inhaler (pMDI) resolves the issue of patient co-ordination of actuation with inhalation. In addition, the biofeedback feature of breath-actuated pneumatic nebulizer provides optimum patient comfort. Furthermore, it conserves medication throughout exhalation rather than permitting it to escape and disperse. Such benefits will augment segmental growth in forthcoming years. Portable breath-actuated pneumatic nebulizers segment will grow at fast pace of 6.1% CAGR throughout the forecast timeframe. Ease-of-use and convenience of handling should primarily drive demand for portable breath-actuated pneumatic nebulizers. Additionally, conspicuous size of portable nebulizer and improved asthma treatment will spur segmental growth. U.S. pneumatic nebulizers market will grow at 4.8% CAGR during the forecast timeframe. High growth can be attributable to escalating prevalence of chronic respiratory disorders coupled with rising adoption of smoking. Over 25 million Americans suffer from asthma while 14.8 million adults are diagnosed with COPD. In addition, availability of insurance coverage and reimbursements for pneumatic nebulizers will drive U.S. pneumatic nebulizers industry growth over the upcoming years. Germany pneumatic nebulizers market accounted for market share of 26.2% of Europe pneumatic nebulizers market. Risk factors such as increasing smoking and air pollution form the major factor for development of respiratory diseases. COPD is the most prevalent occupational disorder in the country. This will increase adoption of pneumatic nebulizers. Presence of major players in the country should positively impact Germany pneumatic nebulizers market growth during the projected period. Some of the notable players operating in pneumatic nebulizers market are Philips Respironics, DeVilbiss Healthcare, Omron Corporation, and Becton, Dickinson and Company. Firms are adopting novel product launch and strategic collaborations to reap profit and gain competitive advantage.